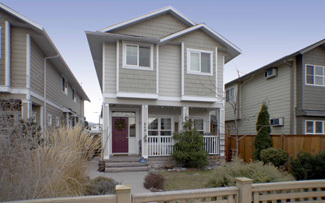 Great location just 2 blocks from Okanagan Lake, 5 to the farmers market. In excellent condition and great value too - hardwood/tile floors, stainless steel appliances, 3 bedrooms, 2.5 bathrooms built in 2009, still under Home Warranty. Forced-air furnace with central-air conditioning. Fully fenced and landscaped yard perfect for kids and dogs. Covered front porch. No restrictions.